The CNC Router Parts Auto Z and Corner Finding Touch Plate system allows for quick and precise setting of your tool height and work piece corner/edge location. 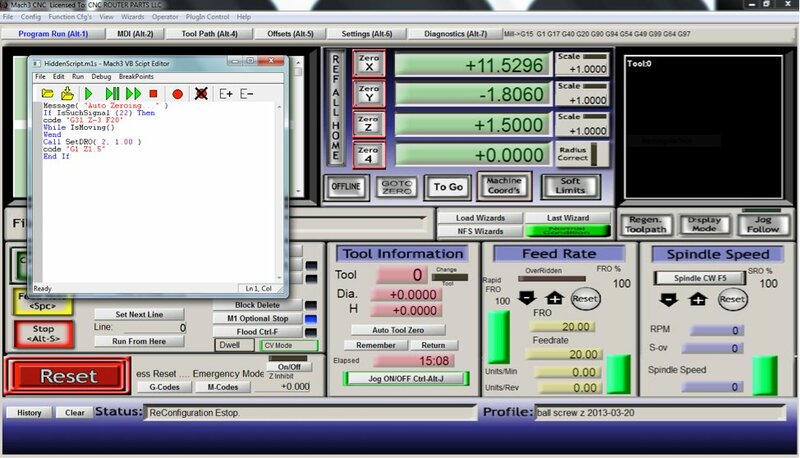 If you purchased one of our Plug and Play CNC Control Systems, Steps 2-4 below are automatically performed for you when you use our latest Mach3 installer and XML configuration files (version 19.2 or later). Please refer to the CNC Software Setup Guide for more information. In either case, you can use a different AUX port if you prefer, although you will then need to re-assign the pin used for the "Probe" function. For older PMDX-126 based NEMA 34 systems, just connect the two leads on the unit to “Signal” and “Ground” on one of the 3 pin connectors supplied with your panel, and plug into the red input signal board. NOTE, the "Ground" should be the lead connected to the magnet (or clip on older models), while the "Signal" should be the lead going to the brass puck on the touch plate. For a DIY system based on the PMDX-126 breakout board, just connect the two leads to an input pin and a common on J11. For a G540 based system, you will need to wire one of the leads to an available input (pins 1 through 4 on the G540), and the other lead to the G540 power supply common (V-, on pin 12 of the G540). NOTE, the V- connection should be the lead connected to the magnet (or clip on older models), while the input pin should be the lead going to the brass puck on the touch plate. Set up the input pin for the “probe”. 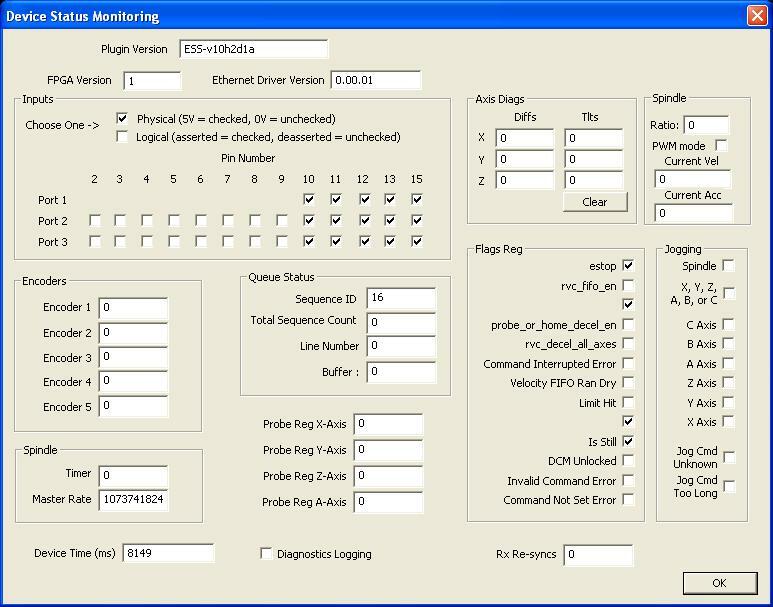 You will need to configure the probe as an active low input on an available open input. The example below shows pin 15 being used, but if you are already using pin 15 for something else (such as a limit switch or estop), you will need to use another available input. 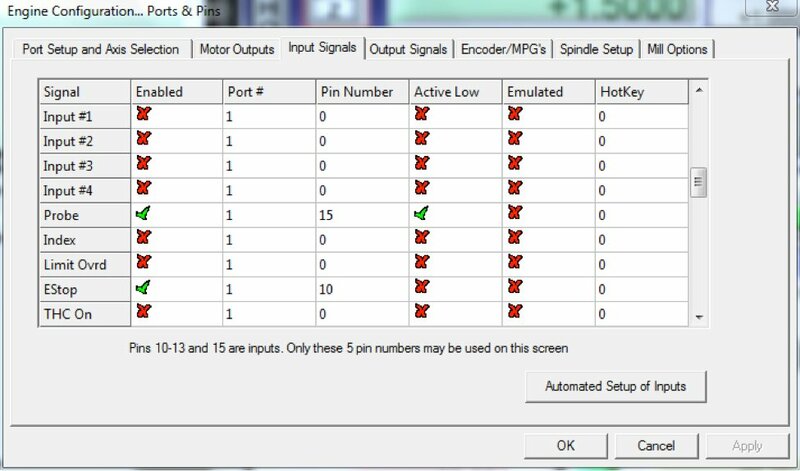 If you have a CRP800 Plug and Play CNC Control Systems, the probe input should already be set up on Port# 2, Pin# 9 (tied to the "AUX 1" input on your controller), or Pin#6 (in older revisions of our configuration files, tied to the "Z" input on your controller). Any changes to pins are made from the Config->Ports and Pins->Input Signals tab. Test the input to insure proper function and pin assignment. If you have an Ethernet Smoothstepper (pre-installed in most plug and play packages), go to the diagnostics page under Plugin Control->ESS Data Monitoring. From this menu, you should be able to see an input signal toggle (check mark turn on and off) when you touch the magnet (or clip on older models) to the brass puck of the touch plate. If you do not see the same signal toggling that you assigned to the probe input, you should go back and re-assign the signal. If you do not see a signal toggling at all, contact us before proceeding further. Go to the Operator menu and select “Edit Button Script”; the configurable buttons on the page will start flashing. Click on the “Auto Tool Zero” button; this will bring up a window with code you can edit. If your CNC control computer is not connected to the internet, you can also download this script to transfer it manually. Once the script is on your control PC, simply open with Notepad and then copy/paste into the editor. Save the file and exit the editor, and then restart Mach3. If your machine has an aluminum table top, make sure there is something non-conductive between the z touch assembly and the table top to avoid creating a false signal. Before running the routine for the first time, make sure the emergency stop is accessible in case something is set up incorrectly to avoid over-driving your z axis.